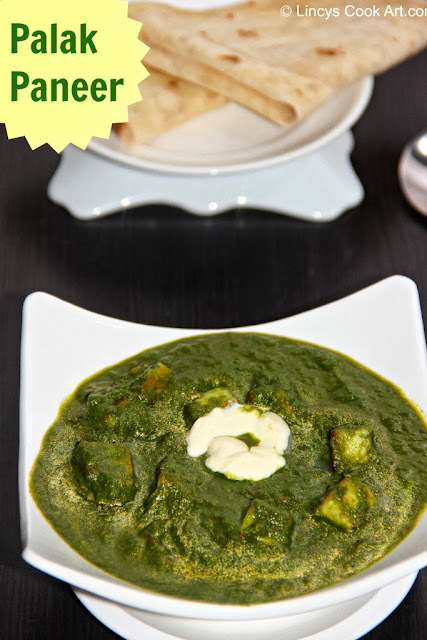 Palak paneer, is a North Indian Dish consisting of spinach and panner (Indian cottage cheese) in a thick sauce/ curry based on pureed spinach. It is a popular vegetarian delicacy prepared in spinach creamy sauce. Bright, vibrant-looking spinach leaves are not only more appealing to the eye but more nourishing as well. Recent research has shown that spinach leaves that look fully alive and vital have greater concentrations of vitamin C than spinach leaves that are pale in color. The study authors suggest that the greater supply of vitamin C helps protect all of the oxygen-sensitive phytonutrients in the spinach leaves and makes them looking vibrant and alive. So select spinach leaves with vibrant colour. In a pan add the chopped spinach leaves and sprinkle little water. Cook this in a medium flame till the leaves started to wilt and cook and volume also reduced for about 3-5 minutes. Add tomatoes in the blender, puree it and set aside. Now add the above spinach and green chillies to grind as a smooth paste. Set aside. Heat oil in a pan and brown the onion ginger garlic paste then add the tomato paste and allow to cook till oil separates on top. Add the garam masala and milk and simmer for about two minutes by constant stirring. Add the paneer into the spinach gravy and allow to cook for a minute. Note: The milk should not be cold while adding. To get more flavor Kasoori methi can be added while paneer is added in the gravy. This dish also can be prepared using mustard leaves. Paneer can be replaced with tofu in this gravy to make this dish more healthy. very very delicious palak paneer :) looks so inviting !! Super yummy with my fav combo palak paneer. I'm loving it and its one of my fav. I shall try but replace paneer with tofu. nice dish. would love to have it with roti. It surely looks amazing! Nice clicks! nice, healthy dish and beautiful clicks..
Looks awesome! Happy to follow you on facebook! this is one dish i have never tried to taste and make...yours looks perfectly cooked. Thanks so much for linking to my event.Looking for more..